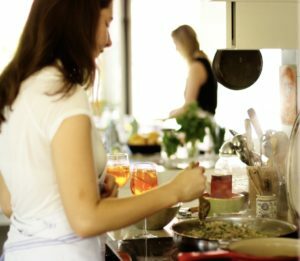 ElizabethPeddey School of Cookery and Gastronomy offers hands on cooking courses and classes, instructing home cooks in the art of home cooking. The school is based in Elwood, Victoria. 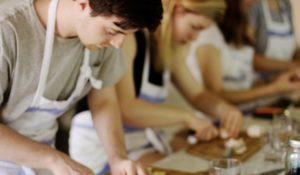 Classes are stylised around practical cookery within the realities and limitations of the domestic space. There is no attempt to emulate restaurant style dining and fussy meals. Rather, classes generally are designed around relatively simple recipes that combine to make a balanced and appetising three course menu. This formula derives from the belief that cooking is more than having a pile of recipes and a mix of kitchen skills. Recipes and kitchen skills need to be learnt with an understanding of the planning, acquisition, preparation and service of meals as well as an appreciation of where, how, when and why we eat what we eat and with whom. These menus will expose you to new ways of considering food. Classes draw on a variety of interesting, seasonal ingredients that command a variety of cooking skills that work to create relaxed, unpretentious, healthy, stylish meals. Your heightened kitchen confidence will enable you and and those you cook for to enjoy the pleasures of good food and wine whenever you please. You will learn how to identify the best quality , locally available seasonal produce and how to maximise the investment you make in the food you grow or purchase, and prepare. You will become a critical and informed consumer and clever about how you sustain and nourish yourself and those you care for. 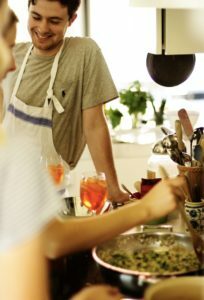 Most classes are small, hands on, for all ages, and conducted in the large family kitchen in Elizabeth’s home in Elwood. The atmosphere is relaxed and pivots on a generous hospitality and supportive environment for learning in. Contact Us today to schedule a course or a class for yourself or someone you love. If you would like assistance in your selection, do not hesitate to call Elizabeth first. Every effort is made to understand your expectations and your needs to ensure that you have the best possible experience at the ElizabethPeddey School of Cookery and Gastronomy.